Changing behavior is the heart of organizational change, so, I when I am getting started on an initiative, like to keep focused on the question, “What will people do different?” This helps sort out what matters from abstract concepts or technical conversations. To that end, I’ve been in a lot of organizational change discussions where people emphatically called for things like “We need to be more collaborative” or “People need to stay focused on the important things.” These kinds of statements are obviously true, and they sound a bit like behavior changes: After all, they are activities people do. But, you can’t really make an announcement and say “you all to be more collaborative.” That would probably just make more people confused. For example, suppose I am the CEO, and I say to my employees: “Be more innovative.” I have authority to make this statement, and it is an appropriate request in a business setting. What will they do? Employees who are fearful about their ability to be innovative might consider quitting their job. Others might start reading blogs and try to pick up some clever ideas to bring back to me. Others might start wearing more artistic looking clothing to appear more innovative. Others will ignore the directive altogether. Whichever the case, when the directive is that vague, people must guess what exactly to do, and they might choose widely divergent and unexpected or unproductive things. To make my request clearer, I could add some research (mentioned in my post here) that shows generating more options before deciding on a course of action leads to greater innovation. This is more specific. Of course, there are many other similar statements about collaboration that we could make. But is it clear yet what to do? Well, it is clearer. But many questions could still arise. Do we have to generate options every time we make a decision? Who is going to conduct the activity? We don’t have a bona fide change behavior until it is specified as an action done by a person at a specific time. 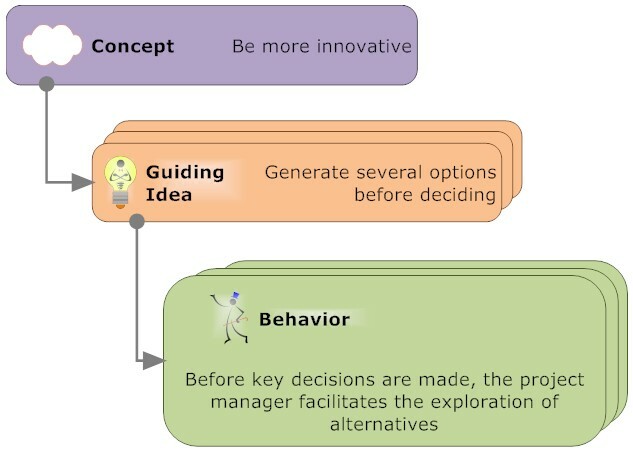 We need something reasonably concrete such as “When key decisions are being made, the project manager facilitates the exploration of other options before the group settles on one.” This produces a hierarchy like that shown in the graphiic, which I have adapted from an explanation in Leandro Herrero’s Viral Change. As you can see in the graphic, I categorized the levels of statements and made them in a small hierarchy. I used the three categories, called Concept, Guiding Idea, and Behavior because these fit to different levels of definition that can be useful in a change effort. Sometime later, I’ll explain it. But for now you can just know I have a reason for defining it that way. Of course, “be more innovative” could have many other general practices and specific behaviors. The point though is that understanding at least a few key specific behaviors is critical because those are what can be understood by the people who need to do them. Also, those tangible behaviors can be measured, and effective influencing strategies can be devised to embed them in the organization. People who are accustomed to traditional strategy making approaches that start with a vision and work down to strategies and process may feel like discussing behaviors is very “tactical.” They often want to talk about visions and organizational structures. But, those are not end results, and talking about them extensively often results in a lot of slideware and not much change. To avoid getting caught in a spin cycle, it is important to realize that approaches like VSEMs, strategic planning, enterprise architecture, and process design are essentially just ways to get people on the same page about what to make or how to act. They are ways to take a statement like “be more innovative” down to a concrete behavior. So, when going through those approaches, it is important to ensure the conversation is moving toward an understanding of concrete behavior changes. This is why I like the question, “What will people do different?” It keeps the discussion grounded in the end result.